I love ghost signs. These messages from the past are one of my favorite parts of the urban landscape. I get overly excited every time I discover a new one. 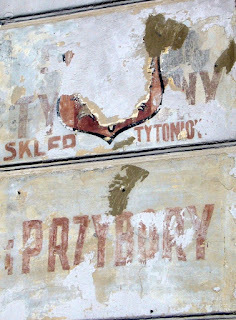 Ghost signs (aka fading ads or brick ads) are old hand-painted signs that have been preserved on a building for an extended period of time and often advertise products, brands, or businesses that no longer exist. They generally date from the late nineteenth and early twentieth centuries, when advertisements were painted directly on walls of buildings by skilled sign painters. Starting in the 1960s new types of ads were introduced, and the old practice of sign painting started to become obsolete. 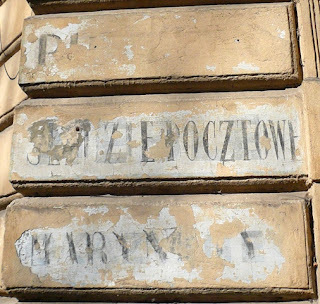 From what I’ve observed, ghost signs in Galicia and Lviv differ somewhat from those found in western Europe and the United States. 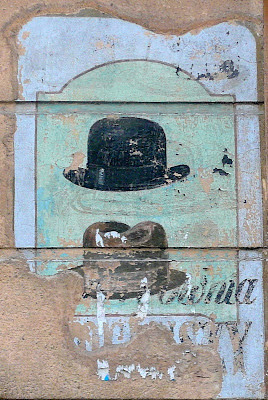 In the West, ghost signs are most often found on the sides of brick buildings and advertise a brand or a product, while in Galicia many (at least most of the ones that are still around) were painted on the front of stores to advertise what products were for sale. Most examples still visible today advertise food items like cheese, butter, tea, or other items such as shoes, hats, school supplies, footwear. 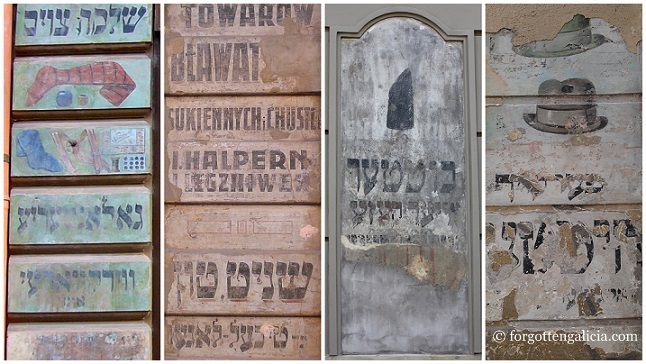 Lviv’s ghost signs are in Polish, Yiddish, German, and Ukrainian—the four main languages spoken in Galicia before the war—but by far the most are in Polish. 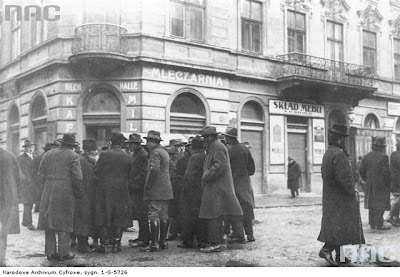 German was the official language in Galicia until the late 1860s when Polish became the official language, as it was also in interwar Poland. 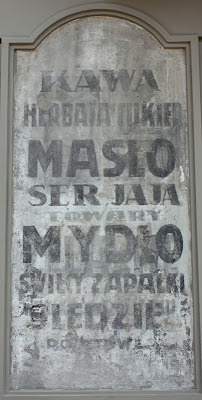 One of the best preserved ghost signs in Lviv is on a former milkhouse. 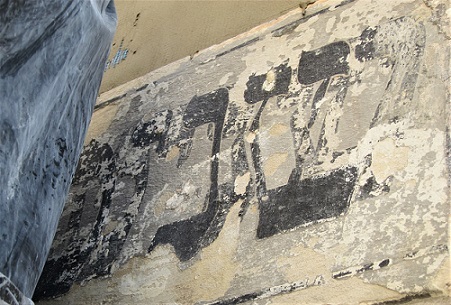 A list of the various dairy products it sold was painted on the facade of the storefront, each section painted in a different language: Yiddish, German, and Polish (from left to right). 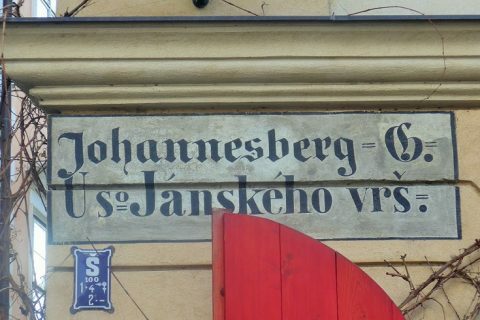 There is an old photograph of the building when the signs were not yet ghostly but actually still served their orginal function: to inform the multilingual public as to what sort of goods the store sold. 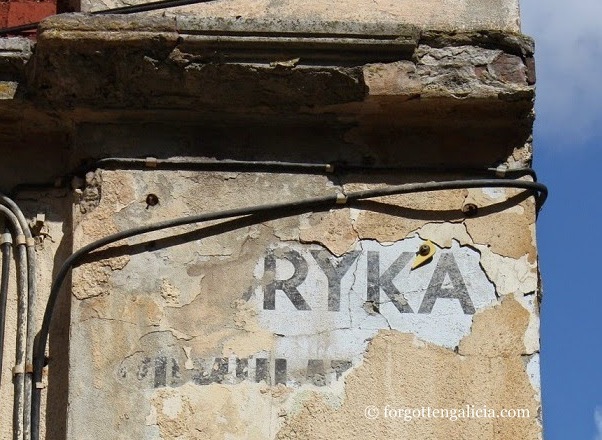 As they are still visible today, it has become a ghost sign. The storefront is no longer a milkhouse, but a copy center. So in addition to the painted signs advertising sour cream and milk, modern signs inform the public as to what services the copy center provides. Around the city there are many other ghost signs. 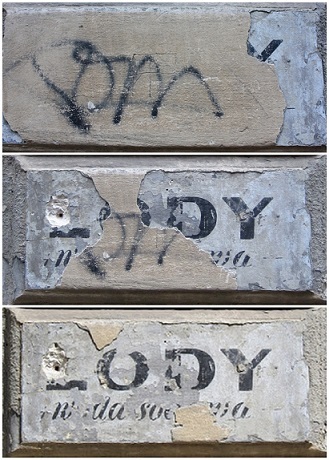 Some have been around for decades, others recently uncovered, others almost entirely faded, others with just a few letters visible. In the UK and the US, many of the ghost signs remained overtime, left exposed and unpainted even after a business or product became obsolete. Occasionally, new ones are discovered upon demolition of later-built adjoining structures. 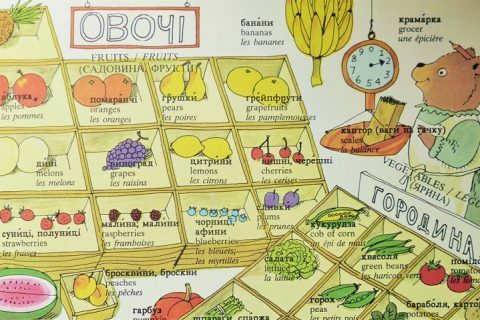 The situation in Galicia is quite different—largely because of its Soviet history, for when the Soviets took power after WWII, the majority of hand-painted signs were plastered or painted over. One likely reason was to eliminate the presence of any language other than Russian from the urban landscape. 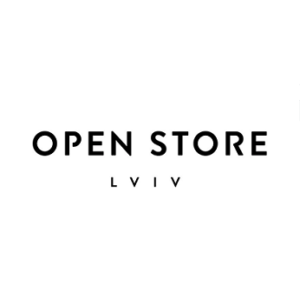 And the other major reason was because most of these stores or brands suddenly ceased to exist as private businesses were expropriated. 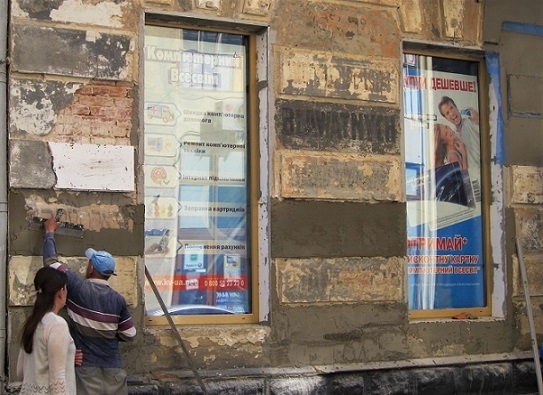 In addition to time and weather, there are also curious people who take it into their own hands (literally) to liberate signs that are already partially exposed and reclaim the pre-Soviet history—de-Sovietizing the landscape, as I like to call it. See more examples of ghost sign liberation here. 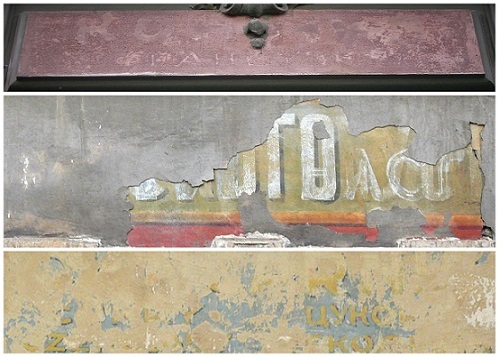 Another interesting phenomenon (which is also fairly common for ghost signs in the West) is multi-layered ghost signs—when even older signs are visible under newer layers of paint and words. Signs were repainted regularly to keep up to date with the latest design and color trends, as well as to stay up to date with the shop’s available products and services. 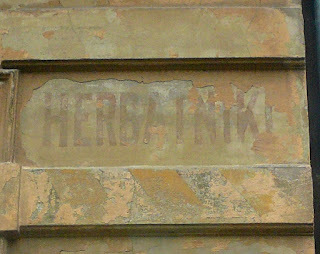 A unique feature of Lviv’s (Galicia’s) hand-painted signs is the presence of painted stripes, which designated certain kinds of stores. 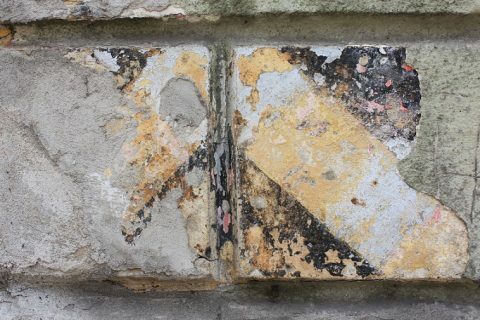 More about Lviv’s painted stripes can be found here. Not only on the buildings’ facades, but also inside carriage entranceways and entrance hallways advertisements and informative messages were painted. More examples can be found here. 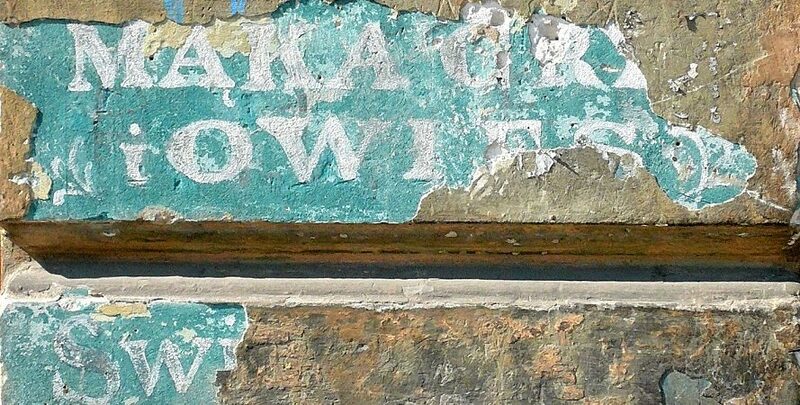 Ghost signs are lovely: they add charm to the city, help us feel the city’s old atmosphere. They are a reminder of a different era—not only of when the landscape was void of neon lights and bulky plastic signs, but of the city’s multicultural and multilinguistic past. They help us understand how people used to live and what products they used. Hand-painted signage was a unique artform within itself, into which people put a lot of time and effort, understanding the importance of aesthetics in their everyday lives. I’m looking forward to discovering what still hides beneath the layers of time, what new messages we will receive from the past. 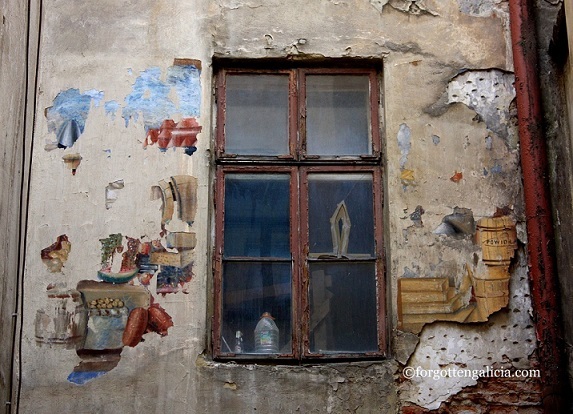 This beautiful mural in Passage Andreolli, which is quickly crumbling away (most of the right side with the barrels is gone already), was painted by artists from an avant-garde collective called Artes that existed in Lviv in 1929-1935. PS. 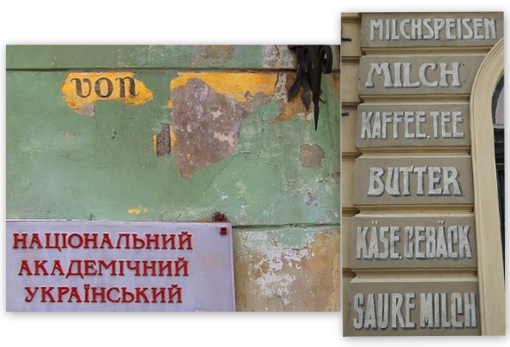 A collection of Lviv’s prewar ghost signs can be found in Minima Ucrainica, a quartely newsletter on Ukraine and Eastern Europe. PPS. 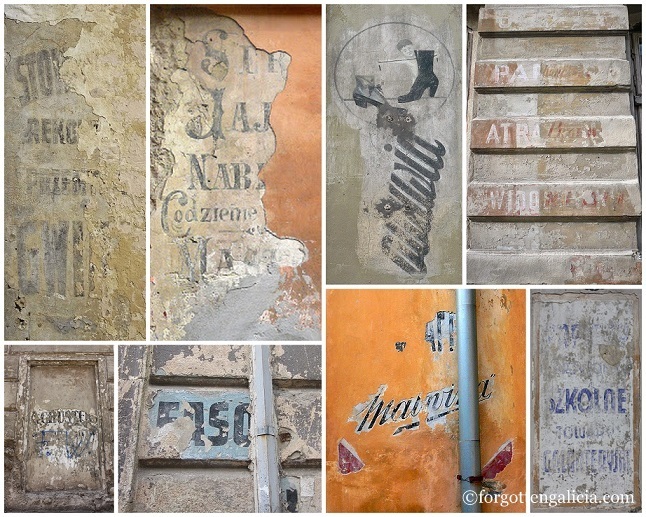 This is an updated version of my first post about Lviv’s ghost signs, which I published in 2012. The original post can be found here. That is so sad to see the ruined and abandoned Synagogues. Excellent site. These images are haunting. Am glad that these photos are online…will share this site on Facebook and Twitter. Wow, these are so beautiful! Do you know if possible to purchase prints of these anywhere? Or would it be easy for you to upload a high quality version of the images? I’d love to hang some of these in my home! Also, thanks for these blog posts. I always learn something new and interesting! I don’t know of them being available to purchase, unfortunately. I also would love to have reproductions of these! As for high quality versions of the images – the highest quality I have is quite small. In printed form probably just large enough for a postcard. My mother was the sole survivor in her family. She was from the town of Kuty, once Poland, now Ukraine. I believe her mother and other family members were burned in the synagogue in town. 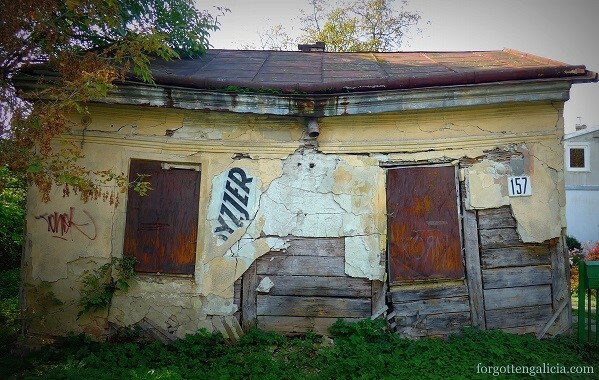 Have you ever encountered the town of Kuty and does anything, especially a synagogue still remain there. My father’s family was from Cznovitz, Romania, now Ukraine. Have you ever been to this town and seen a synagogue there? I have little information on my family and my parents are deceased. Any information would be helpful as a place to begin to search for my grandparents, aunts, uncles.